How often do you pass this unassuming but striking little building, identified on our postcard as the Government Bridge Guard House? 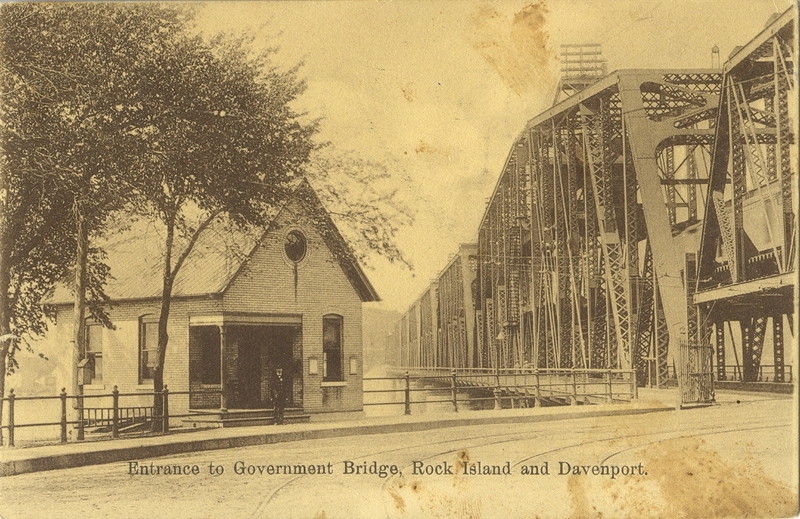 Only when walking or waiting for the bridge to open is there an opportunity to examine it and compare it to the early 1900s postcard from Greg Binder’s collection. The most obvious difference between the postcard and the actual building is that it’s not really red brick as depicted, but rather a soft buff yellow – now darkened with age — much like the color of the limestone of the nearby Clock Tower building and other historic Arsenal structures. Those historic stone buildings were completed between 1867 and the early 1890s. The Guard House was constructed when the current Government Bridge was built in the mid 1890s. Over the years the view seen on the postcard has changed. An addition to the rear or west of the building added restroom facilities. The left window opening has been enlarged and a wide stone sill added. This front area may have been redesigned as a semi-open area where the bridge personnel could greet the public. 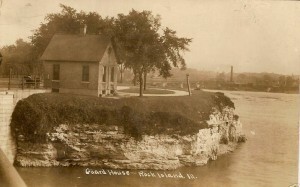 Another Real Photo postcard view of the Guard House is nearly identical to that on the colored featured postcard. Although not shown on the postcard, the east side, the front, has a fluted cast-iron column supporting the cantilevered roof. That column is similar to many that appear within the historic stone buildings on Arsenal Island. 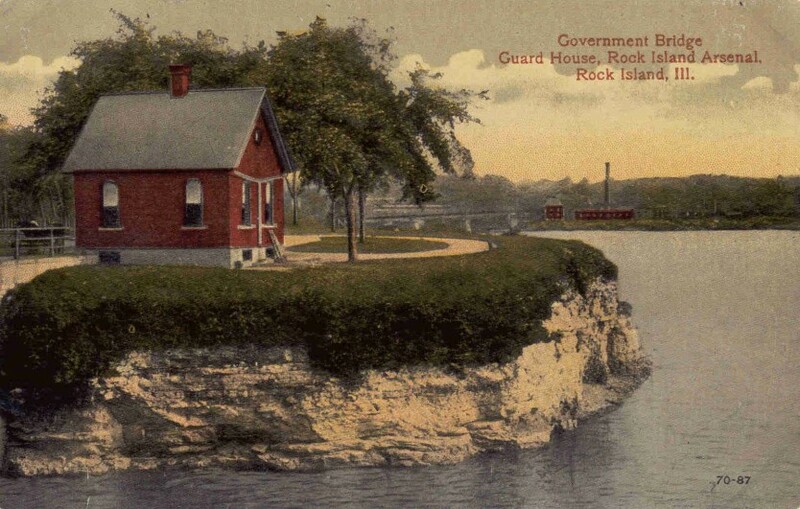 When the postcard was created, the Guard House was located at the very tip of Rock Island, with the river splitting around it as shown, one side going to Sylvan Slough, the other forming the main channel of the Mississippi. This point, with its full view of the downstream river, was so strategic that it was chosen for the western military outpost of Fort Armstrong in 1816. The old name of Rocky Island is certainly descriptive. In contrast to many river islands which are little more than sandbars, this island is composed of limestone that can be seen in the layered substrate beneath the Guard House. That rock is still visible today from the bridge, although the lower portion has been partly covered with earth fill and newer concrete blocks. The two openings or caves at the far right of the old rock foundation are now obscured, but their presence is confirmed by an 1846 work by John Caspar Wild at the Figge Art Museum. 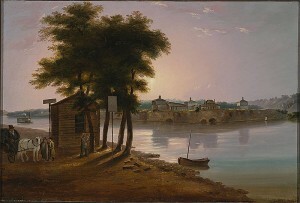 His painting of the by then abandoned Fort Armstrong as seen from Davenport shows three caves beneath the old fort. When the lock and dam system was installed in the early 1930s, the entire western tip of the island was reconfigured. Now there is a lawn rather than river water beneath the rock outcropping and a large intermittent pond partly replaces the south branch of the river. That pond is host to an abundance of birds, from wintertime’s bald eagles feeding near the open waters beneath the dam, to summer’s nearly immobile great blue herons stalking their fishy prey while knee deep in water. Others that are often seen include coots and cormorants. Occasionally there appear to be flocks of big white swans on this little lake. Swans……Caves……Is there more to this story? Reflect on the words of Sauk warrior Black Hawk in his autobiography, which first appeared in 1833. He describes Rock Island, “..…this was the best island on the Mississippi, and had long been the resort of our young people in the summer. It was our garden……its waters supplied us with fine fish…. In my early life, I spent many happy days on this island. If the Good Spirit has been driven off for nearly two centuries, then it doesn’t really matter that the white birds we see today aren’t swans at all, but big pelicans which spend a few weeks here during their migration. (Binoculars will show their huge drooping beaks). And Bridge Supervisor Mike Dunne, who collects bridge history and memorabilia, told us that the real cave of the Good Spirit has been buried beneath the current bridge abutment since 1872, when a predecessor wood and iron bridge was built. That cave is shown on Wild’s painting to the left of the paired caves. This article, by Diane Oestreich, is slightly modified from the original, which appeared in the Rock Island Argus and Moline Dispatch on May 6, 2007.